Designed by Judi Boisson. "Bunny-Baby" Bumper on Blue Background with White Bunnies and Hearts . Reversible. Cotton.Note: When washing Bumper, please remove insert. Designed by Judi Boisson. 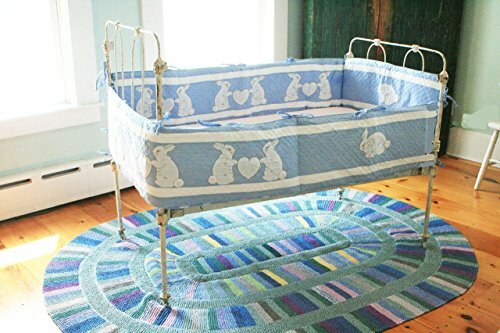 Handmade "Bunny -Baby" Bumper in Blue with White Bunnies, Hearts and two White Bands. Handmade with Hand Appliqued , Hand Embroidery, this bumper is available in 3 color combination, Blue, Yellow, Pink. Reversible. Cold Water Wash. Before Washing Bumper, please remove inserts. 100% cotton. Designed by Judi Boisson "A" You're Adorable" "B" "You're so Beautiful" Yellow Bumper. Cotton. Washable. Designed by Judi Boisson. "Multi Plane" Bumpers in Blue Plaid with Bright Appliqued Airplanes and Tiny Stars and with Stripes along the Border. Reversible. "Loco Local" A train Your little Boy can sleep with Navy/ White. Its Engine- Its coaches- Its rail cars- Its payloads- It's recognizable ! It's Handmade! Designed by Judi Boisson," Mr. Moon" Bumper with his Sky Blue Eyes was able to see all the Stars Above and Beyond. Hand Quilted, Appliqued, and Embroidered. Reversible. Cotton.